Anna university internal Marks 2016 - Anna University released a Notification Last year regarding Internal Assessment Exams to be followed by all its affiliated Colleges. University Planned to have a scheduled test for all its affiliated colleges and those test marks will be consolidated and Internal marks will be given to students (out of 20) for all theory papers.So as per schedule all its affiliated Colleges should conduct 3 Unit Test/Cycle Test / Periodical Test. 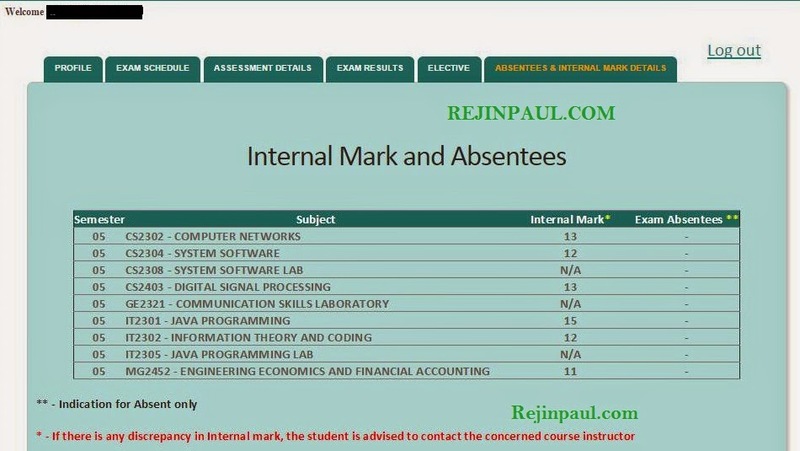 Anna university internal Marks 2016 Updated Upto Last Semester, Students can know their Internal Marks (Out of 20) after all the 3 Assessment Test Gets Over. i.e Assessment Marks for all 3 Unit Test conducted by Colleges will be feeded separately as shown below in image and also attendance details for each subjects will also be entered. From this semester , Anna University has planned to Update the marks ( Out of 20) as and when unit test marks are entered periodically. i.e. if the unit test 1 and unit test 2 gets over, students can check their internal marks with respect to the conducted test. (Out of 20) and after the unit test 3 get over final internal marks will be generated in the portal (Out of 20). This has been introduced so that Students can know their internal marks ( Out of 20) and try to improve if he/she has low internal marks. To know how internal Marks is calculated ? CLICK HERE TO KNOW HOW INTERNAL MARKS IS CALCULATED ? I am having an arrear in 3 sem paper.I have not attended it after that current exam.Now I am going to write to 6th semester exam ,how much marks should I secure to get pass mark.Will the internal mark be reduced to 0 ?? ?